I’m not quite sure what the connection is between a romantic roué/poet, who had affairs with men and women, and reputedly even slept with his half-sister, and a simple hamburger from Providence, Rhode Island. Tom Byng, the founder of Byron, clearly thinks there is, even referring to his own “misspent nights” of youth in his restaurant’s blurb. 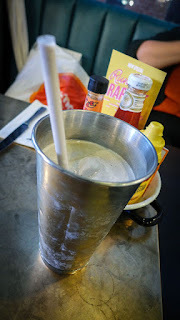 Apparently Tom discovered perfect, simple burgers (“the ultimate comfort food, and so satisfying in their simplicity”) during a four-year stint in America and was determined to bring them to the UK. Launched in 2007, the Byron chain changed hands in 2013 for the nice neat sum of £100 million. Mr Byng, roué or not, clearly knows his burgers. This is the latest mid-brow chain to grace (or sully, depending on your point of view) Newcastle’s most elegant street, but if you like burgers, it’s probably welcome. 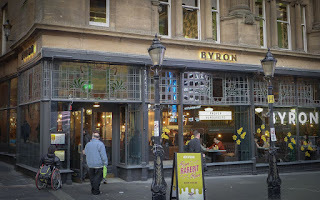 Byron arrives with a reputation for consistently high standards of food and service, and has the nous to employ the renowned burgermeister Fred Smith as head of food development. They even managed to survive relatively unscathed the revelation that George Osborne is partial to their patties. A couple of years ago it was nigh-on impossible to get a decent burger in Newcastle, but, happily, that is no longer the case. Lane 7 and DatBar still lead the way in the City centre, but there are also good versions to be found at the Malmaison Hotel and at Tyneside Bar Café. Meanwhile the Fat Hippos pile in the student crowds in Newcastle and Jesmond. I initially wondered whether the arrival of this southern interloper was a bit late in the day and Newcastle’s burger peak had passed. Judging by the heaving throngs on both occasions Mrs Diner and I visited (yes, it was so good, we went twice), not a bit of it. On their second night of operations the place was predictably rammed. 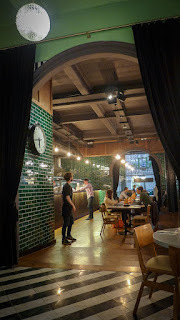 Even so, we were seated in a trice, and everything (apart from a worrying paucity of water in the toilets) seemed to be running like clockwork. A few weeks later the toilets were working and they were still doing a roaring trade. The first bite of their burgers pretty much tells you why. The current special, called “Run Rarebit Run” is, as far as burgers go, a thing of uncommon beauty. At the messier end of the Byron spectrum - it’s possible to eat most of their creations without the things falling to bits, which is handy when you have to make notes for a review - it’s a full-on assault of cheesy, meaty, salty, fatty goodness (well, perhaps not goodness, but at least it offered some pickled cucumber as a token 5-a-day). The beef patty was perfectly pink; the rarebit was rich but tangy and the mustard mayo worked a treat. Everything, encased in an unfussy squidgy bun, was in proper balance. 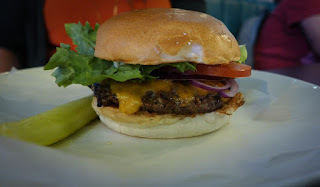 Mrs Diner’s cheeseburger was a bit well-behaved by comparison, but still a solid piece of work, and improved by an upgrading of “Freddar” cheese, which is Fred Smith’s recipe for an American-style cheese with a stronger flavour. Think of it as wrong-but-right tasty plastic. 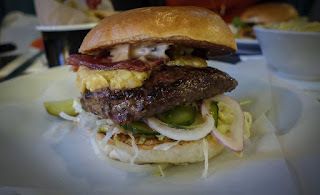 The “Byron” burger, laced with bacon, had been given a ringing endorsement in our earlier visit. Over our two meals we tried quite a few sides, all of which were passable and some much better. Both skinny, and thicker skin-on fries did their job without causing any fuss. 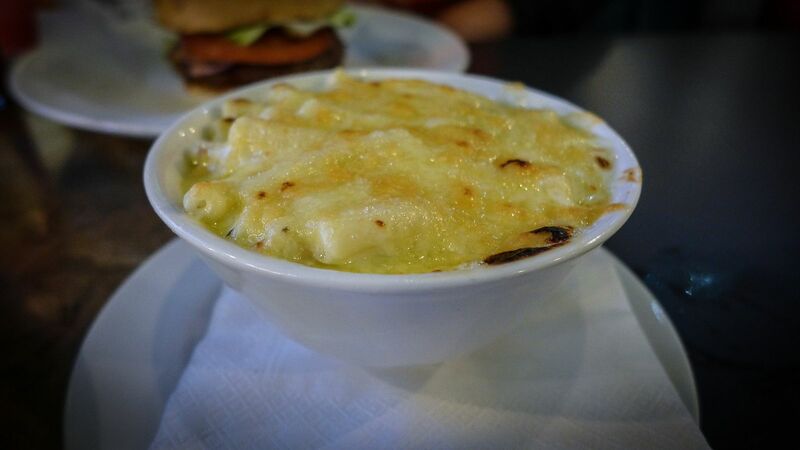 Macaroni cheese had good flavour and a smooth, pasta-hugging consistency. Best of all were the courgette fries, which had a great crunch from having been rolled in, I think, a fine polenta before hitting the scalding fat. Good as these burgers are, for a large and busy new restaurant the service is equally impressive. Legions of cheery young things in t-shirts and plaid hover around, waiting to serve. On the second night of opening, our waitress already knew the menu inside out. During our second visit a side order that arrived just a few minutes after our mains was removed from the bill without asking. All this indicates proper training and attention to detail. This rather grand building used to be an H&M store, so as we sat amongst the wreckage of our artery-worrying indulgence, we tried to suss out which items of clothing we had replaced in the room. Mrs Diner said I was a pair of David Beckham longjohns (she wishes), whilst I accused her of being a pair of skinny jeans. 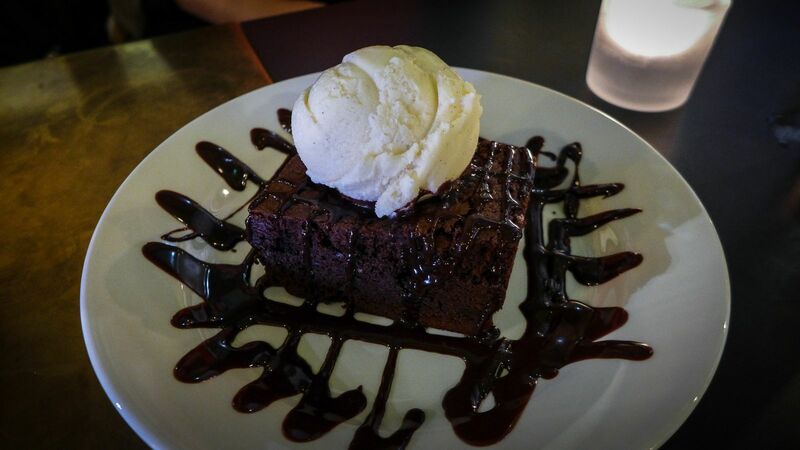 Which was ironic, as she had just ordered a chocolate brownie to join my banoffie mess, adding to the obscene pile of calories we’d imbibed during the preceding half an hour. The skinny jeans would have to wait. This conversion from fashion emporium to burger bar has made the most of the high ceilings, stained glass and nicely tiled floors. Seating includes banquettes and booths. So, what’s the catch? Well, for Newcastle, it ain’t exactly cheap. 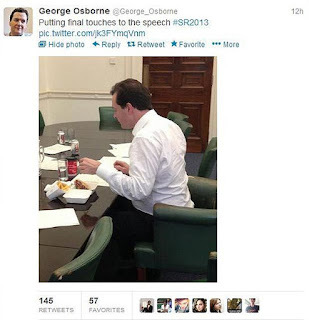 George Osborne was hauled over the charcoal for the price of his gourmet burger. 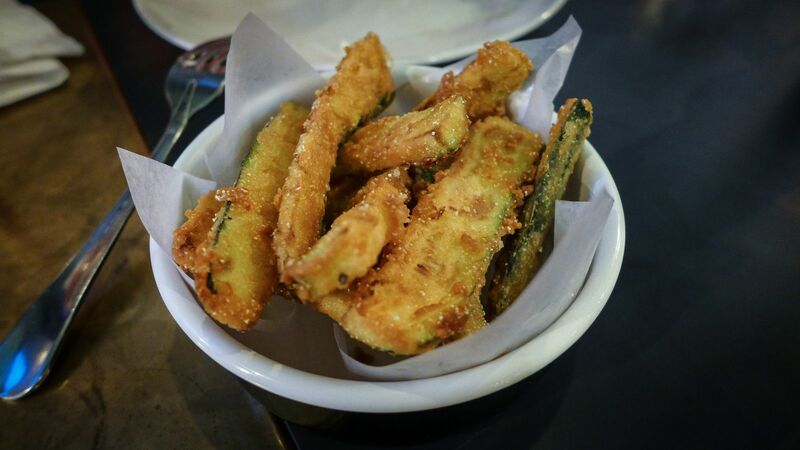 Most of them are around the ten pound mark, not including chips or sides, which are another three or four pounds. Milkshakes are £4.50 (the Oreo one is pretty damn moreish) and a pint of some pretty average house IPA set me back £4.75. With London prices like these, I sense that someone wants some of their £100 million back. From what I can see, Newcastle burger-lovers are going to do their bit for Byron’s investors. Despite the cost, Byron will undoubtedly pack them in. Yes, it’s a chain, but the fact they can turn out burgers like these is the only thing that really matters. Highly recommended, even if my doctor wouldn’t agree. Worst burger I have ever tasted in my life. I'm scared that this sets the barre high for you.